Risotto is classic Italian comfort food at its finest. Creamy, comforting and a wonderful dinner party starter or main. 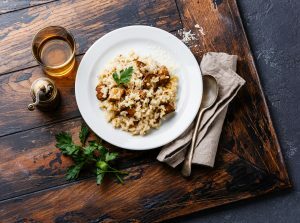 Dr Ciara Kelly of The Irish Balance has shared with us a fabulous, easy to recreate-a- home recipe, that will have your guests and their tummies singing your praises. Finish with lashing of fresh parmesan for added indulgence! Set a pot on a medium heat on the hob or stove, and add the olive oil. Add the garlic and onions, and sweat the onions until translucent (usually 3-4 minutes). Add the mushrooms and broccoli florets, then cook for another 2-3 minutes. Add the thyme, coriander and ginger and mix well. Add the pearl barley, followed by the broth (or stock) and water. Once at boil, turn the heat down to a simmer and simmer for 30-35 minutes until the pearl barley is cooked. Add extra liquid during this time if the risotto dries out – make sure to check on it every ten minutes or so! Finally, add the spinach leaves and simmer for another 2-3 minutes while they wilt into the barley.